Make your own falafel at home using dried chickpeas – and better yet, make a huge batch and freeze the rest so you always have some ready to use! They are delicious in wraps, pita, on couscous or salad! 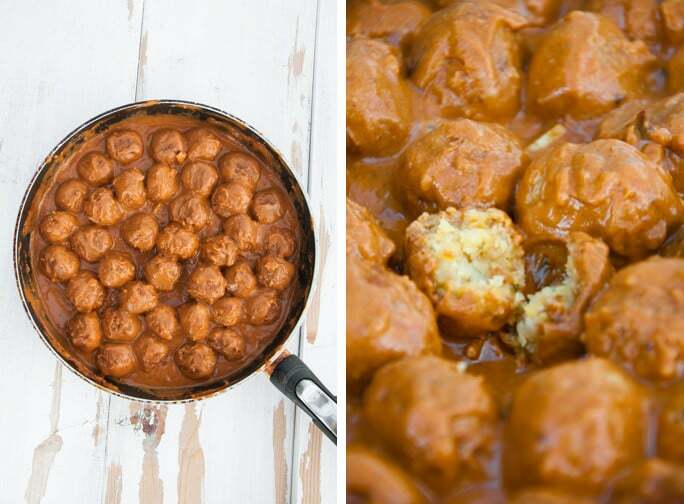 These balls of chickpea goodness are awesome! I always make a huge batch of Falafel, because they freeze well and it doesn’t really take that much longer to make more of them. I love them in wraps, on couscous, in the pide bread, in pita-sandwiches or in curries… so good! 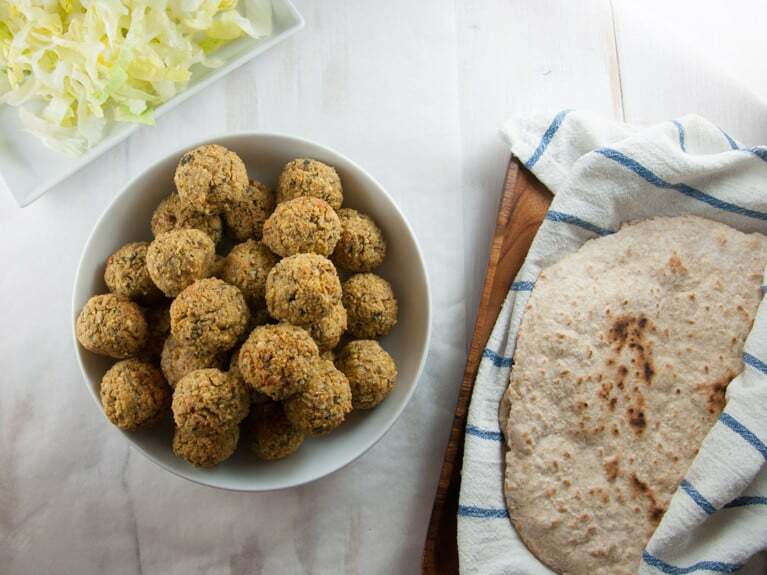 These falafel are not only vegan but also gluten-free! Chickpeas are rich in protein and iron and because they aren’t fried like you would get them at restaurants, these could be considered as healthy (or at least healthier)! For these Falafel, I used dried chickpeas, but if you prefer using canned chickpeas, I’ve got a version you’ll love here. Making Falafel is super easy! For these, I’m using dried chickpeas, that are soaked overnight. Place them in a food processor together with softened onions and garlic, herbs and spices, lemon juice, chickpea flour (the binding ingredient) and baking powder. Pulse until combined. Then form balls and bake these in the oven until browned and crispy. on a leafy green salad with soy yogurt sauce or tahini dressing! I wouldn’t consider the falafel you can buy in restaurants healthy because they are usually fried. 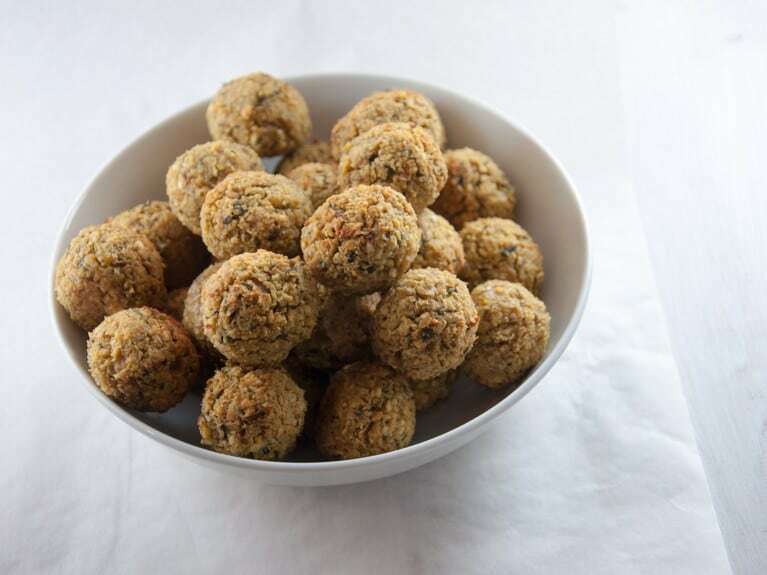 These Falafel, however, are baked in the oven and therefore a much healthier option! Yes, especially these ones are super freezer friendly. Bake them, then let them cool off completely, transfer them into a ziplock bag and freeze up to 3 months. 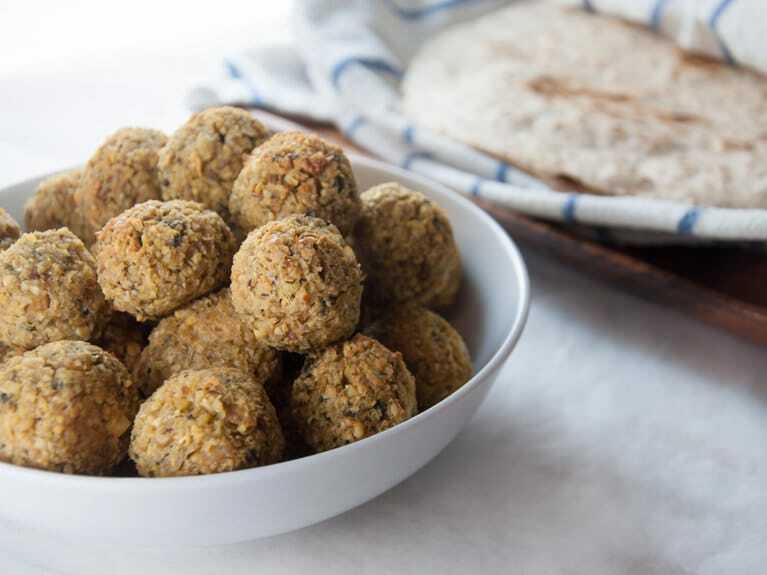 For reheating, you can pop them in the microwave, bake them in the oven, pan-fry or add them to a Falafel Curry (it’s my favorite way to use frozen falafel because it makes them super soft again). 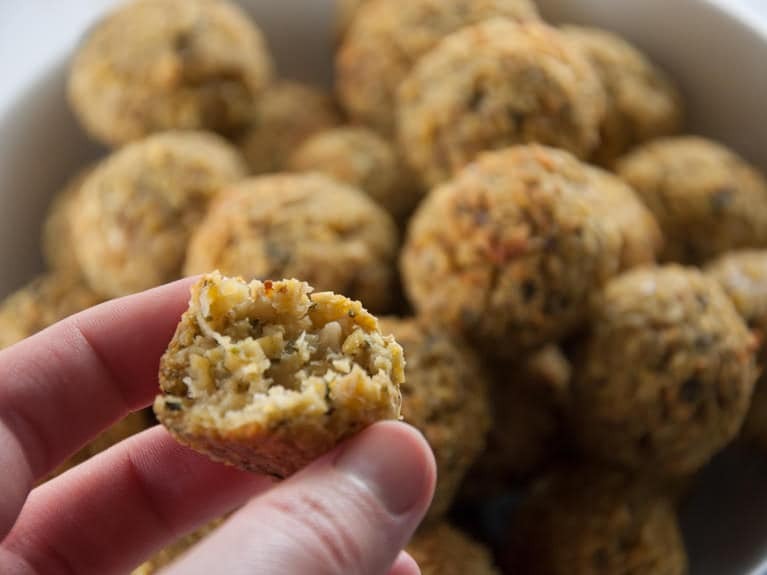 Can I use canned chickpeas for Falafel? Absolutely! If you don’t want to use dried chickpeas, you can use canned chickpeas. But it’s best to use this recipe for Spinach Falafel and simply leave out the spinach. Vegan Falafel, to satisfy your cravings for the delicious little ball of chickpea-goodness. Eaten in a wrap, pita bread, oriental bread or on hummus. In a pan with a teaspoon of canola oil, add the chopped onions, garlic & cumin and let it cook on medium-high heat for about 5 minutes or until they start to brown. Drain the chickpeas and then work in batches by adding the first batch into the food processor and chop until the pieces are really small (you don't want to make hummus). In one batch add in the parsley to chop it as well. Repeat until all the chickpeas are used. Transfer everything to a huge bowl. Falafel Curry! I love falafel and I love curry, so why not combine them?! So you don’t cook the chickpeas at all first? Just soak them? I cannot wait to try these! Thank you! I made these tonight. Unfortunately the chick pea flour I had was old and stale. So I used Gf flour instead. After adding 1 whole extra cup of Gf flour, it still wasn’t sticky enough to form into a ball. Fearful of losing the flavor, i went ahead and baked it. It still turned out tasty, although not authentic falafel since it was a bit doughy. I plan on giving it a second try with chickpea flour and with less of the suggested sodium. Thank you so much for your feedback. Definitely use chickpea flour the next time, because chickpea flour is one of the best binding flours. If the falafel do not hold together, use more chickpea flour together with more oil or water. But you shouldn’t need that much extra flour. I’ve never had doughy falafel, so this shouldn’t happen with chickpea flour. Good luck on your next try! Wow! Baked Falafel looks enticing Bianca! Loved the fact that you used uncooked chickpeas! YUMMY! They are in the oven as we speak! I’m curious how they are going to turn as I’m only making half a portion and had to replace chickpeas with a canned version and flour with just a basic one! I’m just recently making changes to my diet and would like to enter as many vegan elements into it as I can. I also halved the parsley amount and replaced the other one with coriander (cilantro ). will canned chickpeas work as well? I’ve actually never baked them when I used canned chickpeas for falafel, but I suppose it would work too. Thank you for sharing this recipe with us. I think about serving these falafels my guest on friday night and wonder how you would prepare them in advance best. I won’t have a lot time on that evening and would like to cook almost everything the evening before. I’m a little bit afraid, that they get to dry if I reheat them in the oven again. And how do you handle them when they are frozen? so sorry I couldn’t get back to you sooner! I think they would turn out really dry, if re-heated in the oven. I usually pan-fry them (if frozen, let them thaw before) with a little oil until warm. The oil also helps giving them back a bit of moisture. YUMMMMM!!! This was DELICIOUS ? I have only just started trying a different diet and was very nervous as I am the fussiest person alive, but there was no need to be nervous, I think I have landed in heaven ? You don’t know how happy your comment made me! <3 Thank you so much! I’m glad you like the recipe so much and I hope you’ll find many more you’ll love. Falafel are one of my favs too. I just made these tonight for a lunch prep and my husband cannot keep his hands off of them. Mind you, he’s not really big on falafels, I made them for me! Awesome recipe! I followed the recipe exactly, except, I did not have dried beans, so I used two drained 15oz cans of beans and the consistency was perfect. I would recommend flipping them halfway through. At the end of the bake time, they weren’t brown on top, but they were brown on the bottom, so the rotation may help with the overall browness. Thank you for this wonderful, super tasty recipe. It will definitely be in rotation. Thank you so much for the wonderful feedback, Misha! I’m so glad you and your husband enjoyed them! Good to hear the recipe worked with canned beans too :) Yeay! Hi, I’m looking forward to trying these tomorrow, but had a few question. I’m curious why baking powder is needed? Also how many hours minimum do the beans need to be soaked? I also don’t like anything spicy (hot).. does the cayenne add heat or just flavor? Thanks! Hi Joanne, the baking powder makes the falafel fluffier and lighter. As for the soaking, 12 hours would be a good amount of time. The falafel are definitely not spicy :) You can always leave out the cayenne pepper, they will be good either way :) Hope you like the recipe! I was wondering if the “cumin” in this recipe is cumin powder or cumin seeds? I noticed you had sauteed it with the onion and garlic, so I wasn’t sure. Thanks, looking forward to trying this! Made these last night with some modifications, and they turned out well! I love that it is all bean and no grain flour. ​​​Just sauteed 4 cloves of minced garlic in olive oil, nothing else with it. ​I had 5 cups of processed chickpeas after I soaked, rinsed, and processed them. ​​Delicious in a wrap with avocado or Tahini sauce! My only complaint is that I thought it was too salty, and next time I’ll reduce salt 1/8-1/4 tsp. Thank you for your detailed feedback, Lisa! Yeah salt is always a difficult topic because different types of salts vary & it’s all up to preference, but I’ll have a close look at the salt I’m adding next time I’m making these and adjust/change the recipe then :) Thanks for bringing it to my attention! Followed recipe exactly as written and turned out great! I do think frying them in a little oil made them not so dry. Made homemade vegan pita, pickled veggies and tahini to go along with them! Fantastic! I tried to pick the first one up and the whole thing fell apart. Still taste great. Any idea why that happened? Thanks for your post. I’m wondering though, when making a batch what is the serving size? When putting in how many servings I would like I’m not sure if it’s stating the number of falafel balls or a serving. So good! I just made these and I can’t stop eating them. I plan to make the curry tonight but we’ll see if they last that long, haha! I ended up using maybe twice as much chickpea flour because it wasn’t sticking together at first. I also didn’t know how much a “bunch” of parsley was so I think I put in too much, but they still taste great. Thanks for this recipe! I will definitely be making these many more times in the future! I’m planning to make these tomorrow and am super excited about it! Just wanted to check…do you recommend cooking them before freezing them and then just heating the frozen ones up as and when you want them? yep, I usually just bake the whole batch and then freeze the leftovers. But you could probably do it the other way around as well. I just think they would hold together better when frozen after baking. I want to make these for a large party. Can I make the recipe up to the baking stage, freeze the balls on a baking sheet and put them in a bag. Thaw and bake them the day of the party? when did you freeze them? before or after baking?